Thanks to Beneful for choosing my pups and I to be part of the #FriendsofBeneful ambassador program, regardless all opinions expressed below are my own. I've already shared the fact that my dogs and I are pretty big fans of Beneful and we were overjoyed to recently share the news about the Dream Dog Parks that are in the works this year, but today's news may take the cake. 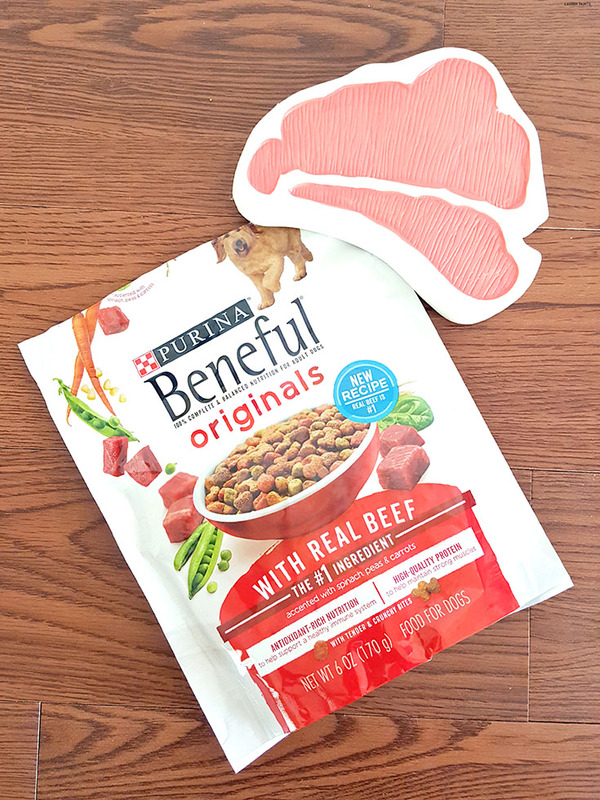 While Beneful was already an incredible food, in my dog's eyes and my own (for obviously different reasons), I'm excited to share that it's gotten even better recently! 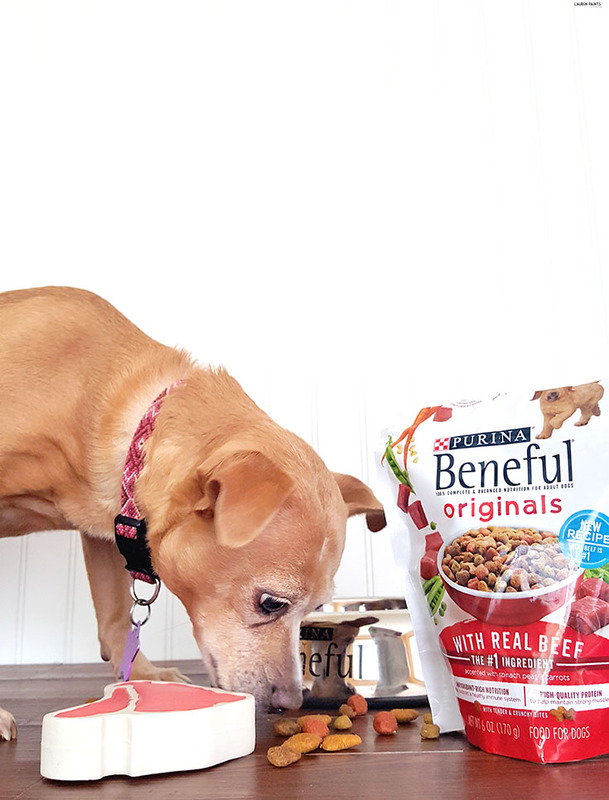 The Beneful team has been working to evolve their food into the perfect food from a dog owner's perspective for the past two years and it's official, they've mastered their craft and my dogs love the new recipe. With meat as the #1 ingredient in both the beef and chicken dry Beneful foods and Salmon hopefully joining the extra meaty-train soon, it's obvious why my dogs are totally gaga over the new formula... and why I'm a happy dog owner knowing I'm feeding my pups something they love and something that provides nourishment for their little canine bodies. Not only did they adjust their formula to include more meaty goodness, there's no added sugar in any of the recipes so your dog can eat without a worry. 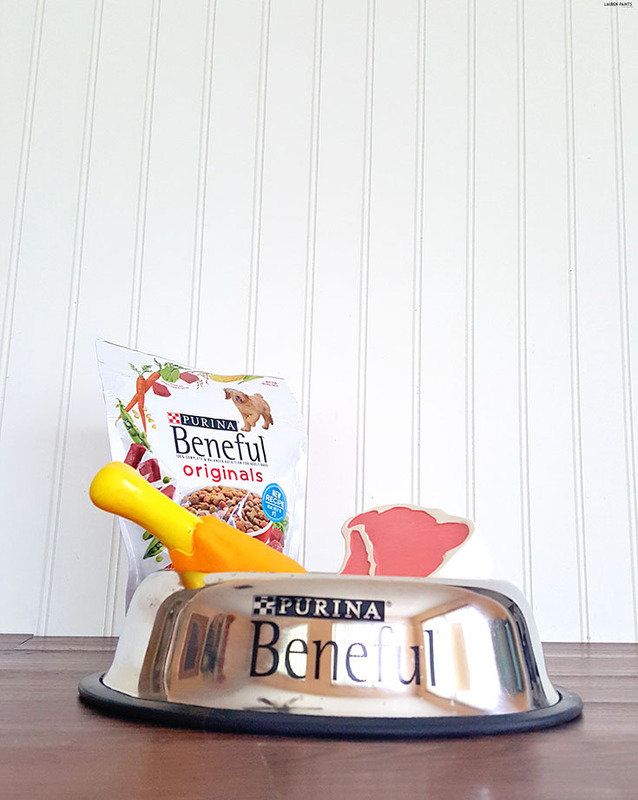 The best part of the news I'm sharing with you today is this: Beneful is so proud of their new formula, they are offering you the chance to sign up for a free sample for your canine friend! 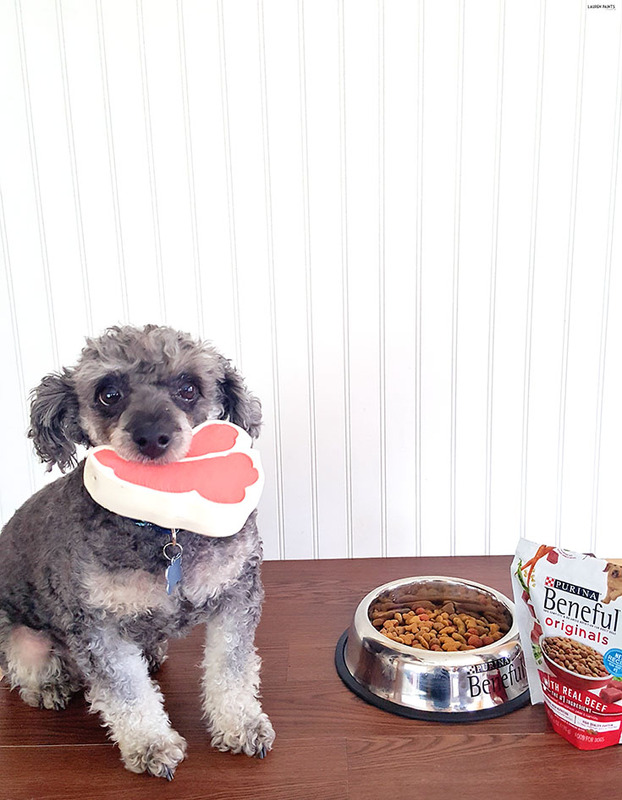 Once the new formula of Beneful has received two "paws" up approval from your doggy, be sure to share a review on Beneful's website letting the world know how much your furry friend enjoys the new food. While the change in Beneful is a good thing, I suppose I should note that you can't just switch your fuzzy friend's food first thing. You'll want to transition your dog to the new food, to ease their tummies smoothly. Want to master the art of changing your dog's food? 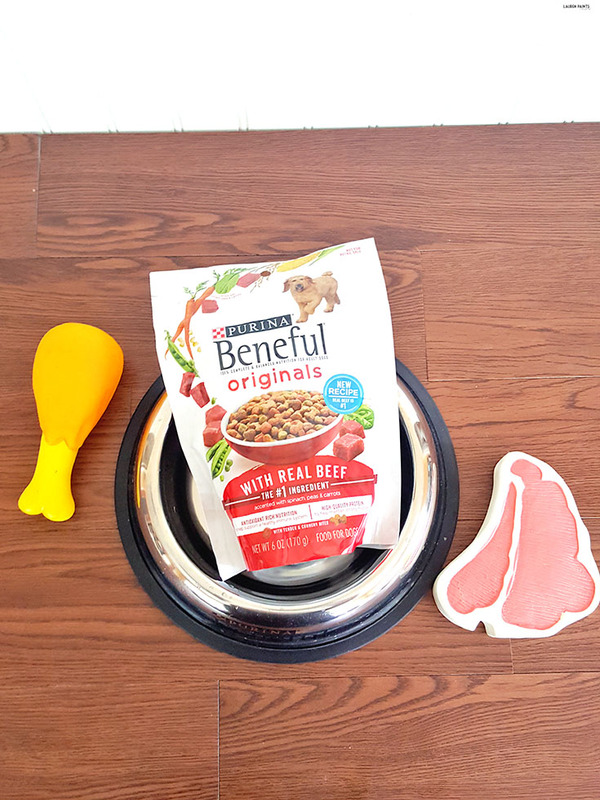 Check out other helpful feeding tips and tricks from Beneful here. Speaking of change, my dogs are going through quite a bit of change lately... we're moving furniture around and getting things ready for our daughter's arrival next month and so far, they've been so very good about all of the new-ness and adapting perfectly. While they've been adapting well thus far, I've been trying to think of fun ways to reward them and remind them we love them since a BIG change is coming soon, which led me to make them a new toy this weekend. I figured we could buy a load of toys, but making one out of stuff that already has our scent, would be a more significant reward. I'm super excited to say that their new toy is easy enough for anyone to make and the best part is you most likely you have the materials laying around your house to put it together right now, if you want! To get this project started you'll want to remove the label from the water bottle and the cap as well. Next you'll want to trim the bottom hem of the dress or shirt off, this will be your ties for the ends of the toy. 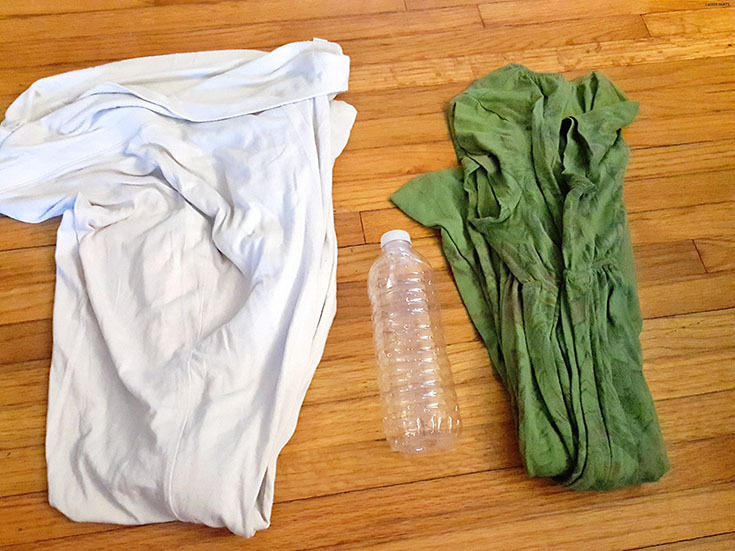 Following this step, you'll want to use the water bottle and measure enough fabric on the pant leg to cover the entire bottle and tie the ends, then cut the pant leg as needed. 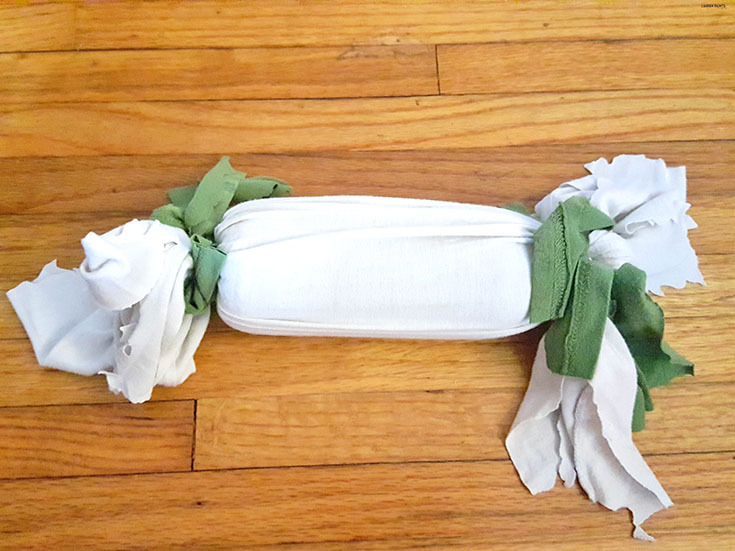 After your fabric is "measured", cut one slit into each end of the pant fabric and tie the bottle inside with a double knot on each end. 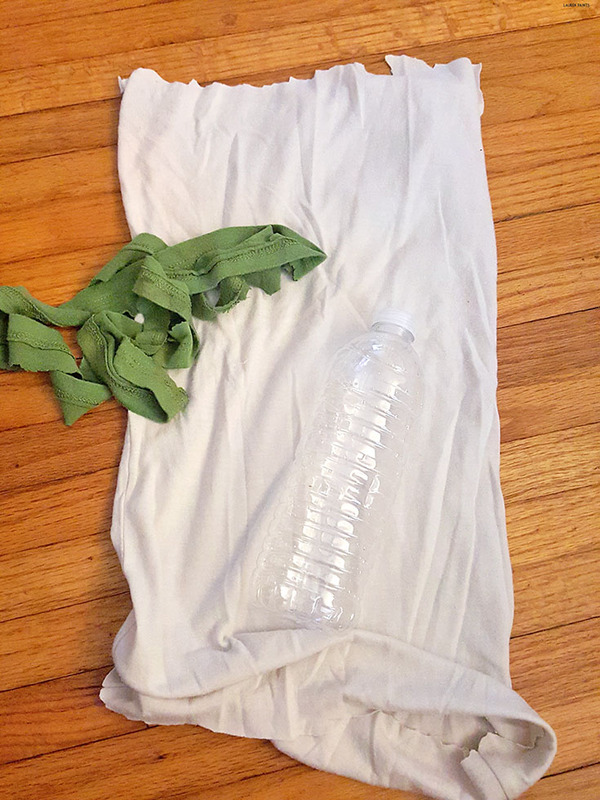 Cut the dress or shirt hem into pieces and tie them around each double knot of the bottle. 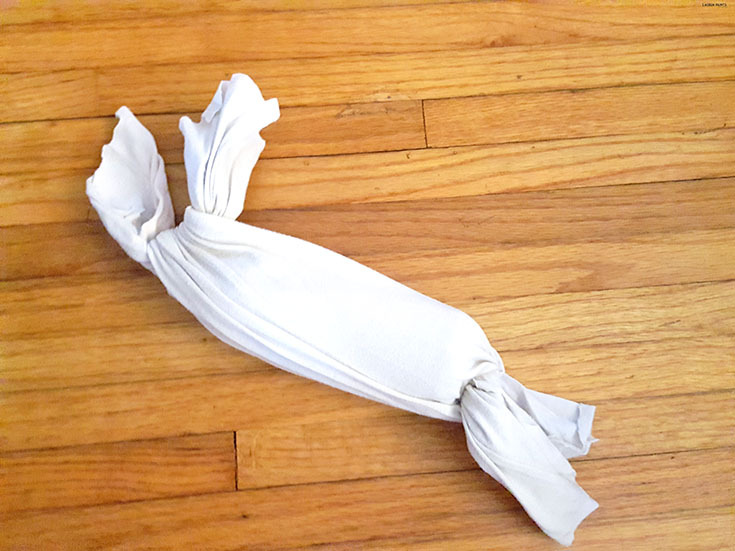 Since my pant legs were choppily cut anyways, I went ahead and added a few extra slits to the pant fabric to make for some frayed ends, if you would like you can do the same to add some texture and make it easier for your pup to grab. 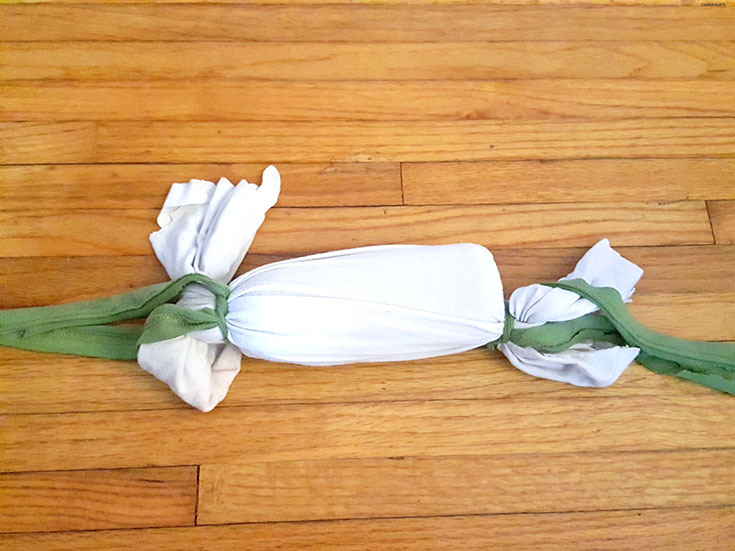 Now's the fun part for you and your pup, hand this cute little tied fabric toy over to your fuzzy best friend and let them enjoy! 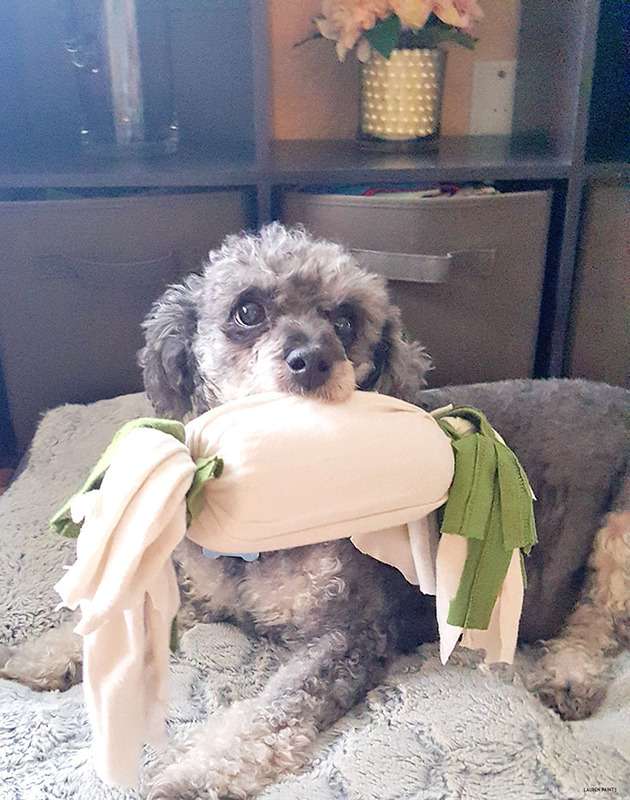 It's that easy to give your dog something they'll adore... and it's all made with stuff that would likely end up in the trash or recycling anyways! The best part of this toy is the fact it smells like me somewhat... so while we're at the hospital next month this will be a great way to remind them of me. 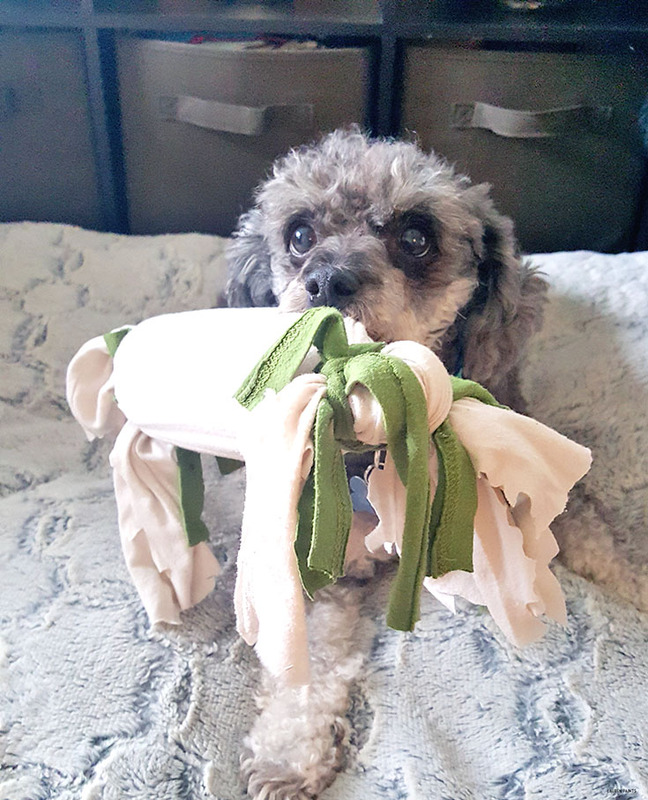 If I don't say so myself, this is a great toy for a dog going through a transition... and I think my poodle friend agrees! So tell me, have you changed anything major in your dog's life before? Thinking it's time for a change? 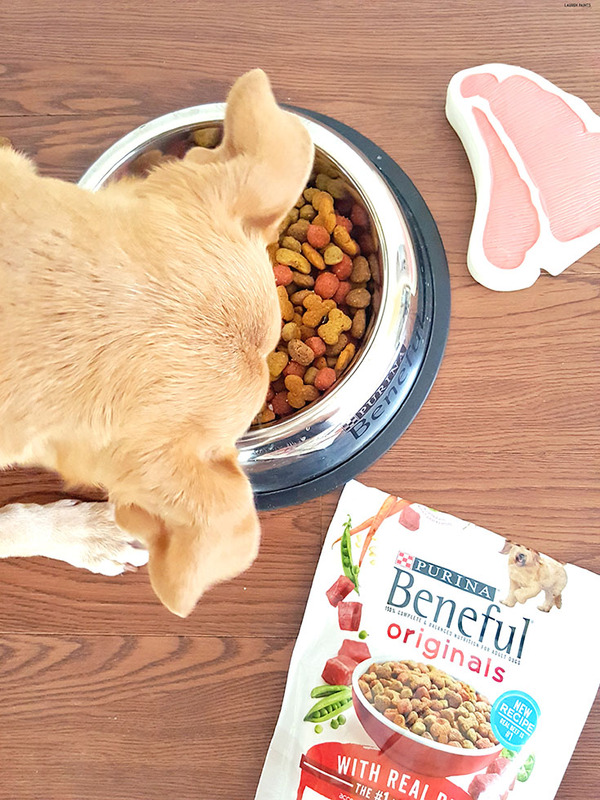 Don't forget to snag a free Beneful sample here, then let me know all about your doggy's life changes in the comments below.